Plenty to talk about after looking over the late night computer model data. We'll discuss timing of storms, what types of severe weather, and an updated Freak-Out-Meter. I just looked over the late night computer model run and wanted to give you some idea what the latest high resolution computer models are projecting for Sunday's possible severe weather outbreak. First, here is a look at the 4km RPM model from the midnight run. 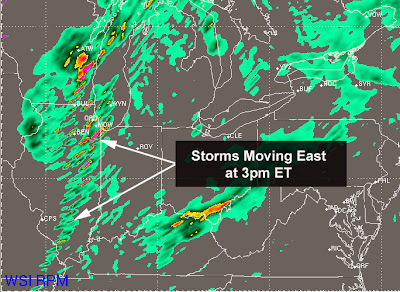 This is looking at the model's projection of what radar imagery will look like at 3pm ET. At this point the model is suggesting scattered thunderstorms are developing and trying to become more organized in to a line. Notice the location of the storm clusters. One up around the Chicago metro area and then it stretches down to southern Illinois and in to southeast Missouri. One concern with this data... The Chicago Bears are hosting the Baltimore Ravens. At 3pm ET, the game would likely be in the middle of the second half. Having tens of thousands of spectators in the stands while severe thunderstorms are moving by is not the best thing. It will be interesting to see how the NFL handles things tomorrow. Now we move ahead two hours to 5pm ET. You can see the line is moving through central Indiana at this point. A couple things to note. First, notice the "stronger" looking storms over northern Indiana. I think that is definitely a possibility. 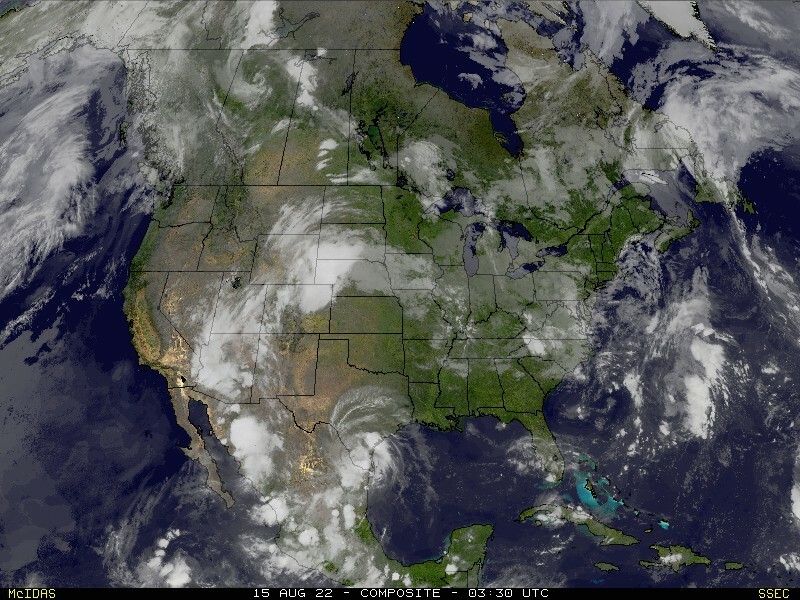 Also notice the lack of storms from Indianapolis down to Bloomington, IN. Not sure what to make of that. Perhaps the model is picking up on something. That said, don't let your guard down in central Indiana. Now we skip ahead to 7pm ET. 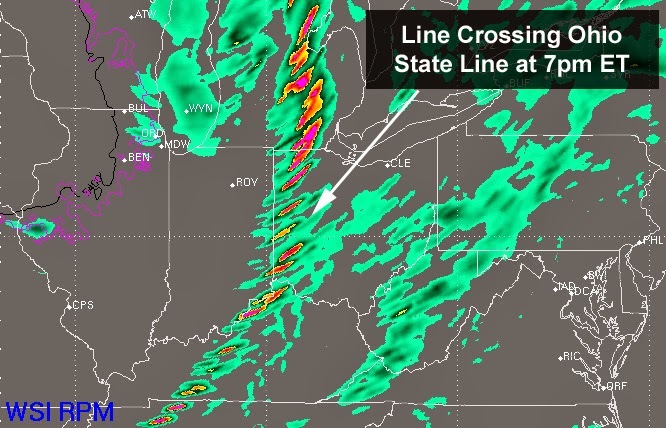 At this point the model has the line of storms crossing the Indiana/Ohio state line. Still some very strong, and likely severe, storms moving east. If this works out to be true, I have a feeling many people in Indiana will be going outside to start cleaning up from the mess left from the storms. The next two animations are from other high resolution 4km computer models. They are both running off the WRF model, but they both have different flavors. One is called the ARW and the other is the NMM. These animations are courtesy of the people at WxBell. Note that with this model, instead of bringing the bulk of the storms through in one line, it develops two lines of storms. My guess is the model tries to develop thunderstorms early ahead of the cold front and pushes those east. Then behind that line, along the cold front, it tries to develop another thin line of thunderstorms. The NMM keeps it similar to the RPM with having one line of storms coming through. Hopefully by now you have seen the latest from the Storm Prediction Center. A "High Risk" is in place for parts of Illinois and Indiana which includes the cities of Indianapolis, Bloomington (IN), Lafayette, Terre Haute and Champaign (IL). 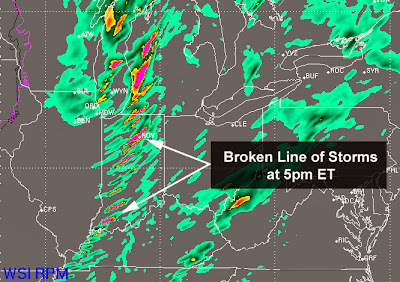 All along the main threats for storms Sunday have been damaging wind and tornadoes. Now that we are getting closer to the event we can start breaking the threat down more by probabilities. Here is the Storm Prediction Center's probability forecast for damaging wind. SPC indicates there is a 45% probability of severe winds for a large part of the Midwest. The hatched area indicates a 10% or greater probability of wind gusts in excess of 75 mph. Here is a look at SPC's probability forecast for tornadoes. In the "High Risk" area they indicate a 30% probability of a tornado. Perhaps more importantly, look at the hatched area. It covers a very large area from Cairo, IL to Toledo, OH. The hatched area means a 10% or greater probability of an EF2-EF5 tornado happening within 25 miles of any point within the area. That is significant and echos the threat tornadoes will be Sunday. It doesn't mean there will be a tornado, but it tells me that there is a chance for one, or a few, strong tornadoes. Wife and I remember you from KFVS and we live in southeast Missouri so we figured we would visit your blog to see your input on tonights potential storms. Good to see you are still active and informative!